I love the Lilly Pulitzer Murfee scarves!! And now there is one with a cause. 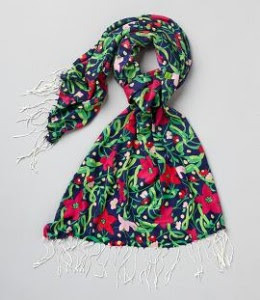 Lilly Pulitzer and In the Pink, a Lilly Pulitzer Via Shop, have partnered with MitoAction.org to create a custom-designed Murfee scarf to benefit children and adults diagnosed with mitochondrial disease. The partnership was inspired by Gordon Russell, owner of In the Pink, whose late wife Sandra K. Russell lost her battle to mitochondrial disease in 2008. Mitochondrial disease is a non-curable, life-threatening condition in which a patient’s energy is depleted due to dysfunctional cells. So if you are looking to pick up a great gift or something pretty for yourself, grab a Mito Murfee from In the Pink and contribute to a great cause!! The best part is the scarf is absolutely adorable! Don't forget about the Lilly Pulitzer sale starting today at 11am ! Thought this was great when I read it on the Lilly blog. I love when fashion meets a good cause. I bought the scarf this weekend in Nantucket and love it - so adorable with a navy t and white jeans.